At the end of August 2016, a new AUMUND special conveyor for the transport of hot DRI (direct reduced iron) will be delivered to the new steel mill at Tosyali (Algeria). A BZB-H-I 900 type conveyor with a length of 116 metres will be employed in Algeria. The conveying performance has been configured for 323 tonnes hot DRI per hour at a material temperature of 750°C. The technical solution was crucial for the contract award to AUMUND Fo¨rdertechnik: in Algeria, AUMUND is counting on using a patented pan conveyor with buckets. The improved sealing protects the material to be transported completely from any environmental influences. Thus, the inert system prevents the reoxidation of the highly reactive bulk material and makes the transport of the sponge iron possible without losing the high degree of metallization. “To produce the same amount of steel, a significantly lower input of energy into the electric arc furnace is needed this way, the tap cycles are reduced and productivity rises by up to 20%”, explains AUMUND project leader Frank Reddemann. The AUMUND special conveyor will be used as the link between the MIDREX shaft furnace and an electric arc furnace for the transport of HDRI. With the support of MIDREX,Tosyali is building the largest plant for the production of DRI worldwide at Bethioua (Algeria). The new MIDREX-Direct Reduction plant will feature a production capacity of 2.5mt (million tonnes) of DRI. Probably starting at the end of 2016 HDRI or CDRI will be produced alternatively without constraints to ongoing production. 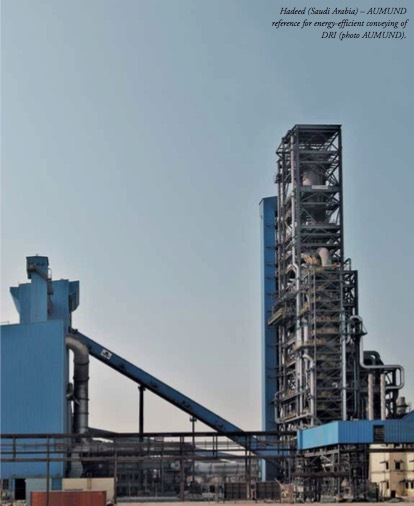 The transport of hot DRI (HDRI) to the electric arc furnace has two distinct advantages: the demand of specific, electric energy drops and productivity rises significantly. The energy savings are achieved, because less energy is needed within the electric arc furnace to melt the DRI. “Compared to cold charging, the transport of HDRI results in up to 6% less wear on the electrodes. The tap-to-tap times get shorter, the demand for carbon as the primary energy carrier will be reduced, and CO2 emissions will be lowered as well”, explains Reddemann. With an HDRI input temperature of approximately 600°C, energy savings will be above 120kW per tonne of liquid crude steel.